Preferences allow you to set default Smart Connection options to your personal preference. Figure: The Smart Connection preferences (shown here in InCopy). When Enterprise Server is connected through a proxy server, enter the credentials here. Display layout name in Create Article. 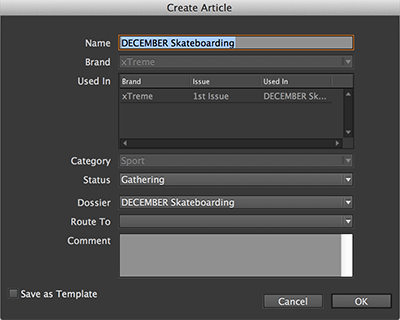 (Available in InDesign only) When selected, the name of the layout from which the article is created is automatically added to the Name field of the Create Article dialog box. Figure: The Create Article dialog box with the name of the layout automatically filled as the name for the article. Show import options dialog on place. When selected, the Import Options dialog box appears each time a file is placed. Object Style: Controls the way an object style is applied when placing an article. See Styling text using InDesign object styles when placing articles with Smart Connection. Bring InCopy Stories to Front in Layout view. (This feature is only available in InCopy1) When enabled, opening an article that is placed on a layout will bring all article components of that story to the front in Layout view. This makes sure that all article components are fully accessible and not obscured by other layout objects. For more information, see Opening articles in InCopy using Smart Connection. Update Placed Enterprise Images When Opening a Layout. Controls whether or not placed Enterprise images should be updated to their latest version. 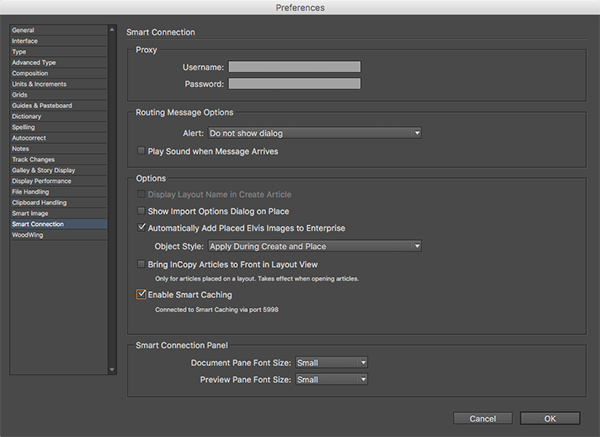 This feature can only be used for InDesign; in InCopy this option is permanently disabled. When this feature is disabled in InDesign, it means that it is controlled through a configuration file. Smart Connection 13.0.2 for Adobe CC 2018 or any other higher version of Smart Connection 13 is required. It applies to images, Layout Modules, and spreadsheets. The working depends on how the system is configured. Document pane font size. For changing the font size of the text in the Document pane when using the Smart Connection panel in List View mode. Preview pane font size. For changing the font size of the text in the Preview pane when using the Smart Connection panel in List View mode. 19 December 2018: Updated section 'Options' by adding option 'Update Placed Enterprise Files When Opening a Layout'.